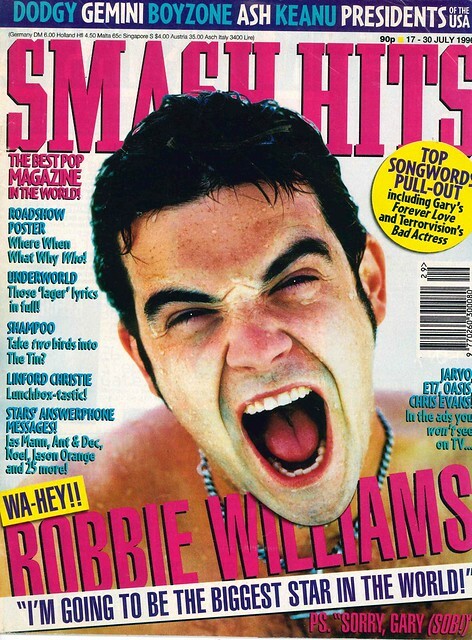 Just gone solo from Take That, Robbie Williams is the cover star of this week’d edition of Smash Hits, declaring that he is going to be the biggest star in the world. 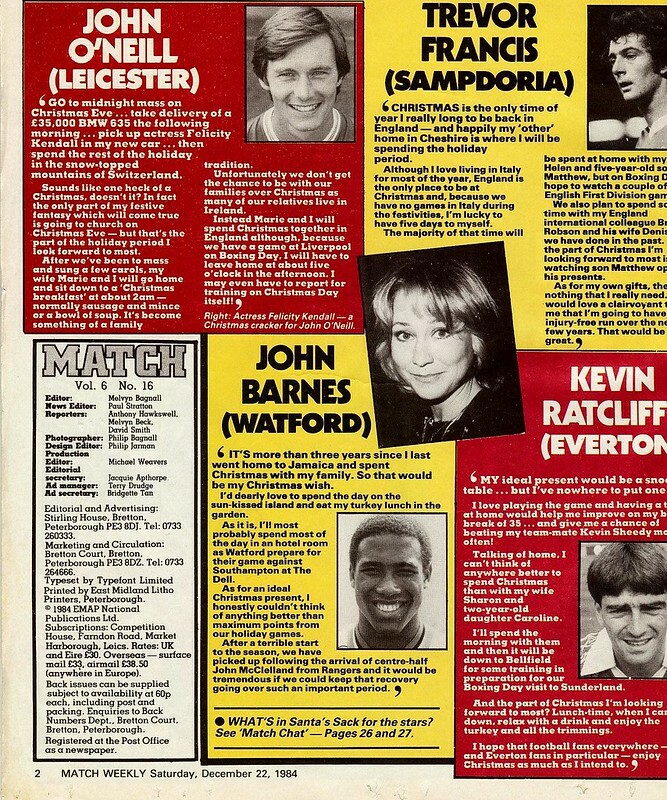 Smash Hits takes it to the British public to see who is their favourite between Robbie Williams and Gary Barlow, with Gary edging 6-4. 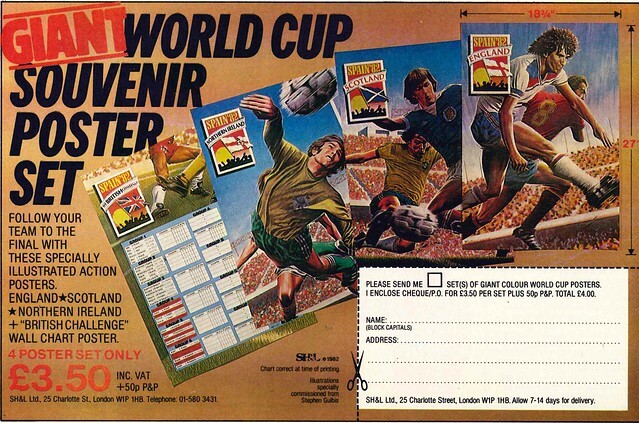 But you had the chance to make your voice heard, with a phone poll to vote for your favourite. 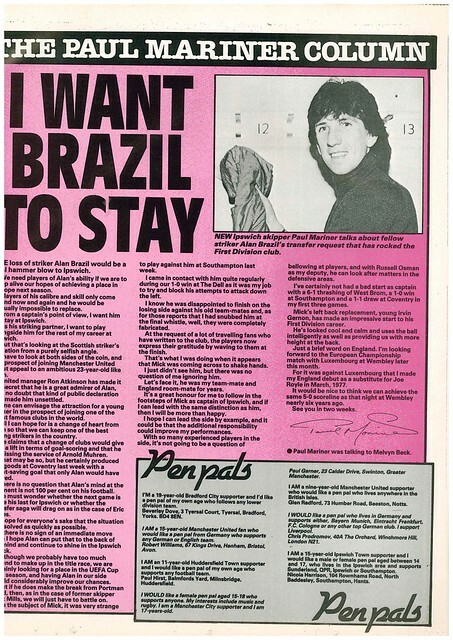 By now, there is an Oasis column, giving you all the news from Planet Gallagher. 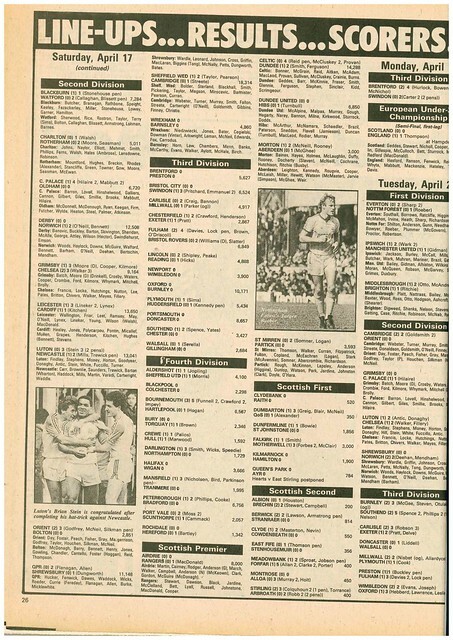 Smash Hits was granted an audience with Glenn from Glenn and Chris, who had a hit with Diamond Lights. 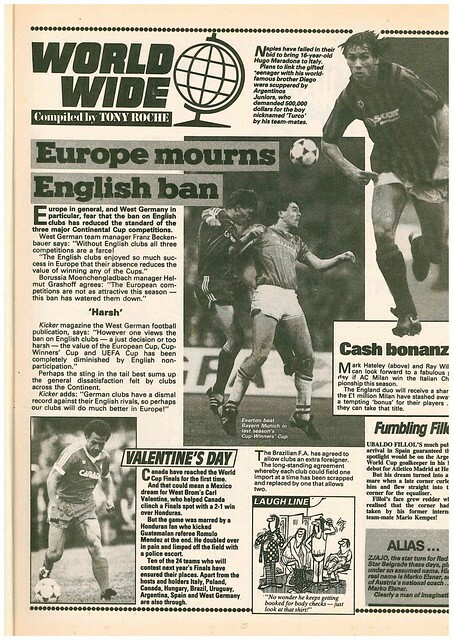 By 1996, he was the manager of the England football team, and gives Smash Hits his opinions on the best young English players there is. 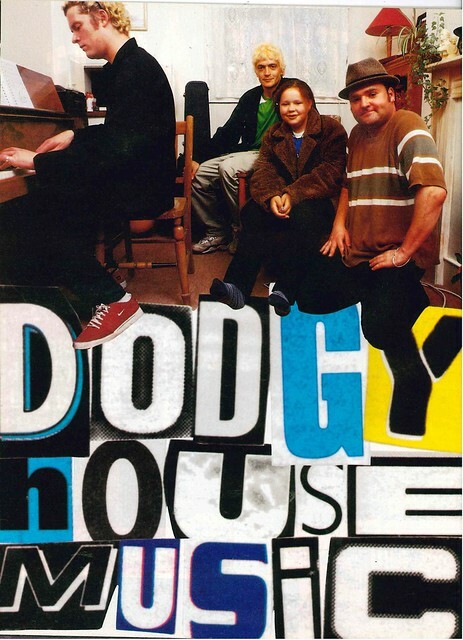 One of the players mentioned was Jamie Redknapp, and his future wife Louise had a party to celebrate the release of her debut album, attended by David Baddiel and Ant from Ant and Dec. 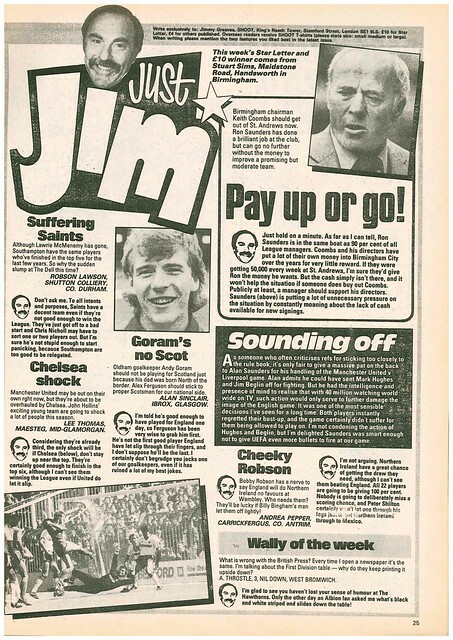 In rivalries news, Crush (featuring Donna Air) have gone to war with Shampoo. 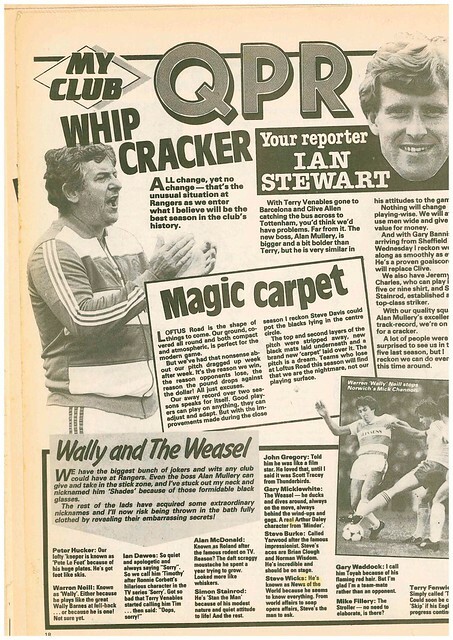 This is followed by a dodgy interview. 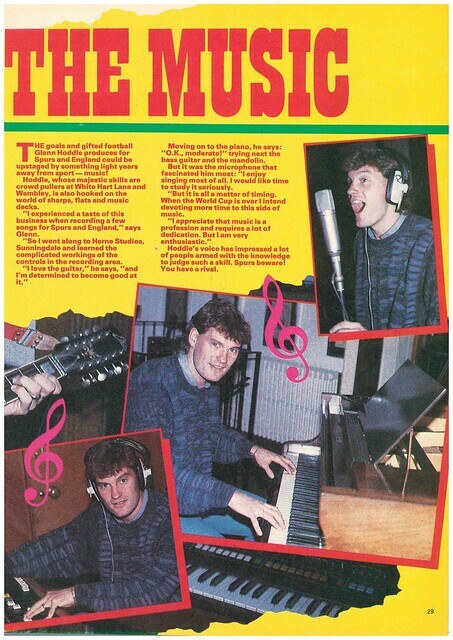 Nothing wrong with the content, it was an interview with the band Dodgy. 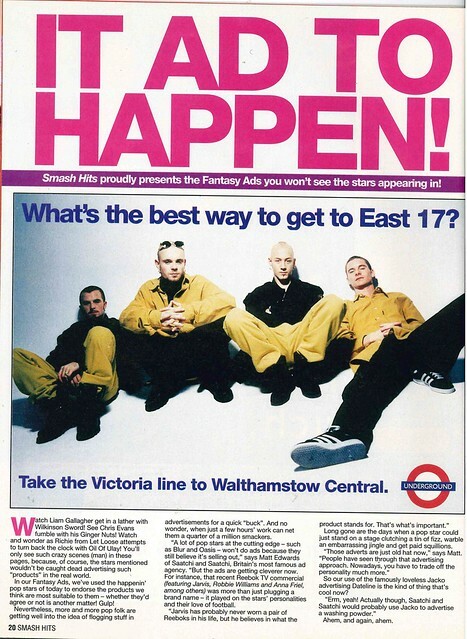 Smash Hits treats us to a double page feature on ads we’d love to see, featuring tour favourite pop stars. 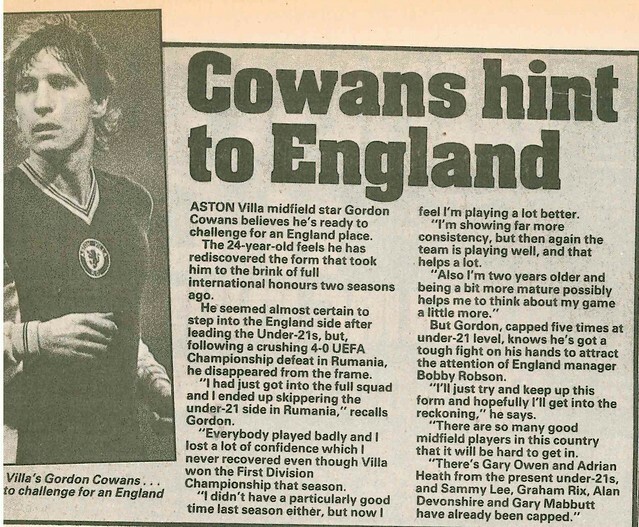 Toni Braxton is interviewed, revealing that she doesn’t drink because she got sick the last time she drank. 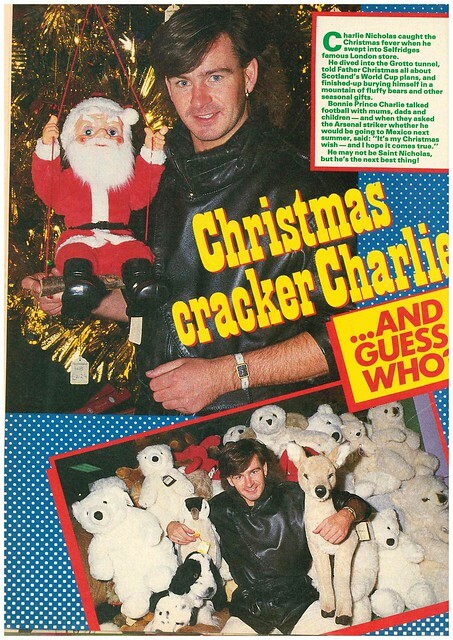 In part four of a five part series of interviews with Boyzone, this week, it is Stephen Gately. 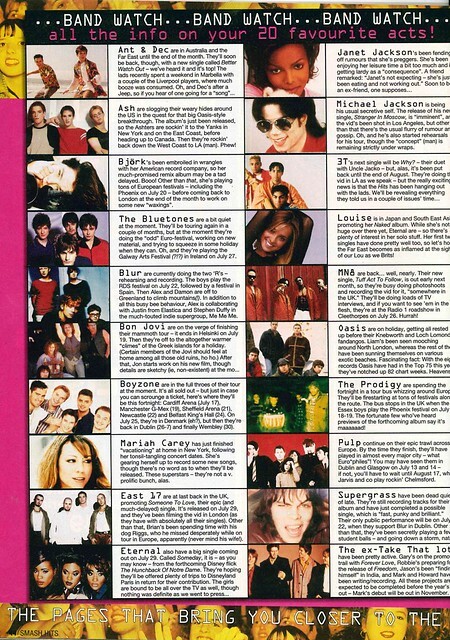 In bandwatch, Smash Hits keeps us up to date with your favourite bands such as Oasis, Pulp and Boyzone. 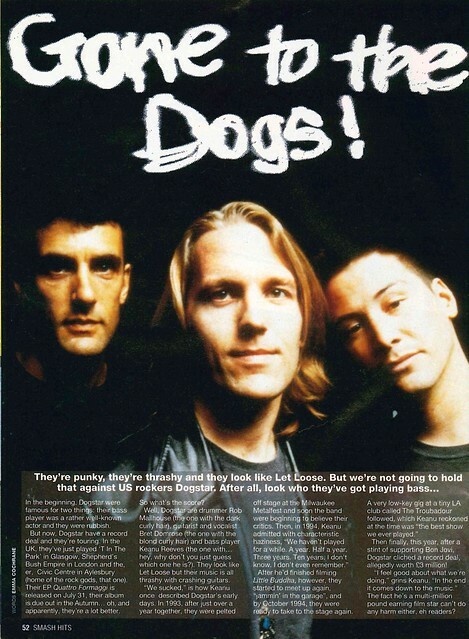 There is a full page profile of Dogstar, Keanu Reeves band, described as looking like Let Loose. 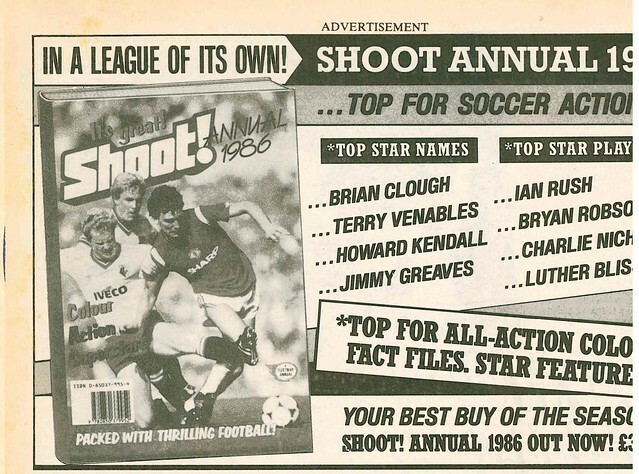 In reviews, Shampoo are awarded Best Album. 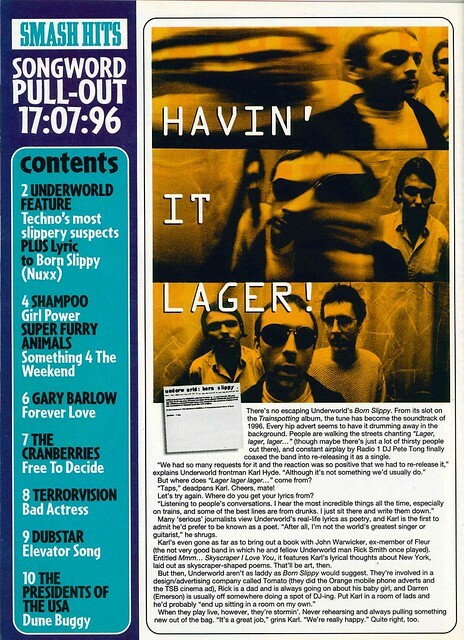 Talking of Shampoo, they take questions from a biscuit tin, revealing that Crush’s new single is the worst song they heard on the radio that week. 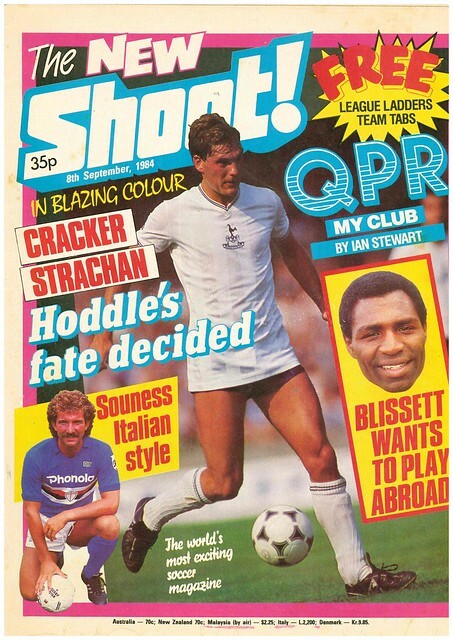 Linford Christie is interviewed ahead of the Olympics, revealing that he isn’t related to Agatha Christie. 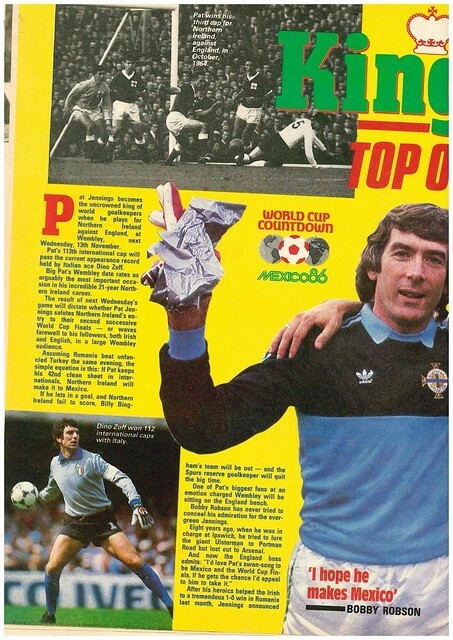 Pat Jennings is the cover star of Shoot, as he gets ready to face England at Wembley in a World Cup Qualifier knowing that a point will be enough for Northern Ireland to go to their second successive finals. 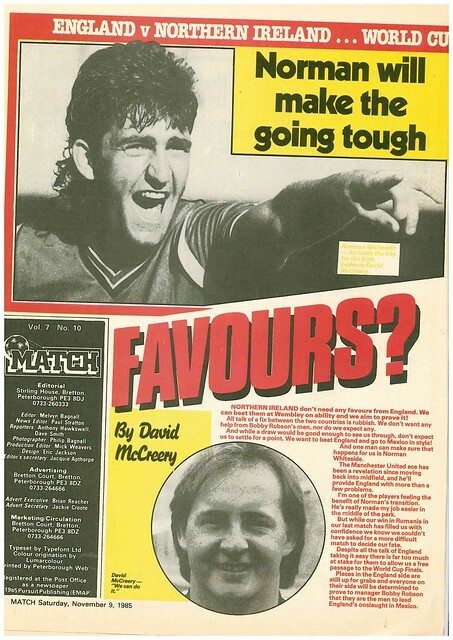 Going into this game, England Under 21 manager Dave Sexton suggests that Terry Fenwick is the man senior manager Bobby Robson should turn to should Kenny Sansom get injured. 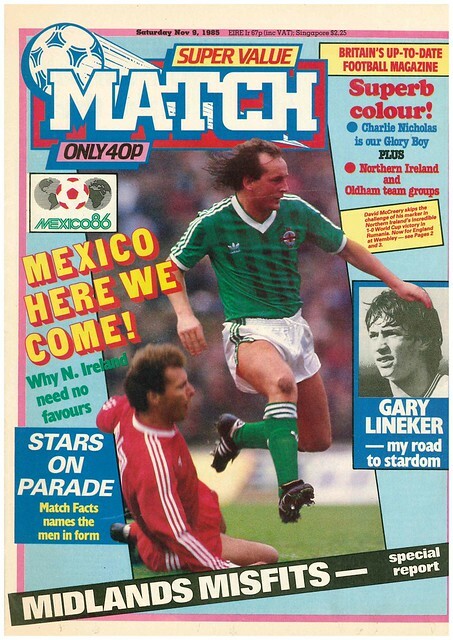 Should Northern Ireland reach Mexico, Martin O’Neill is planning to undergo surgery in a bid to be fit for it, having previously considered retirement due to his injury problems. 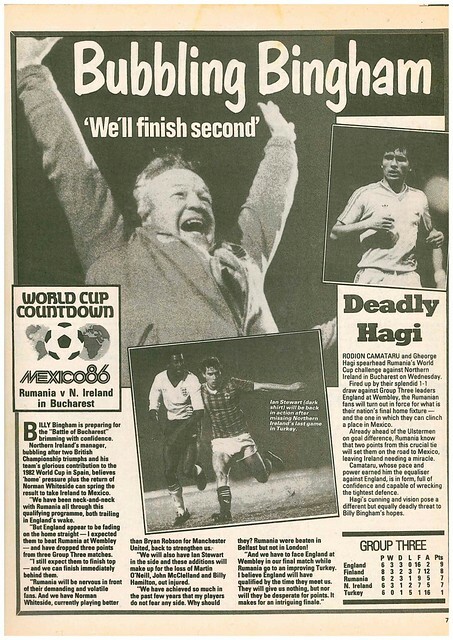 Wales are going in to their Euro 88 campaign minus Mark Hughes for three matches due to a red card he got playing in an underage international in 1983, and have launched an appeal to get this quashed. 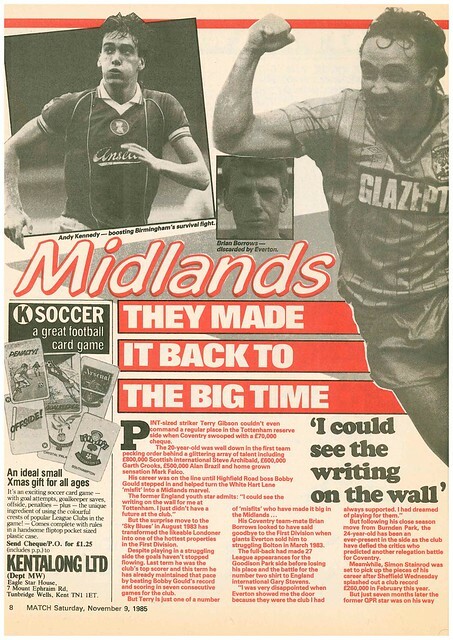 Betty Westmancoat (Walsall) and John Westmancoat (West Bromwich Albion) made history by being the first husband and wife duo to be Club Secretary at two different clubs. 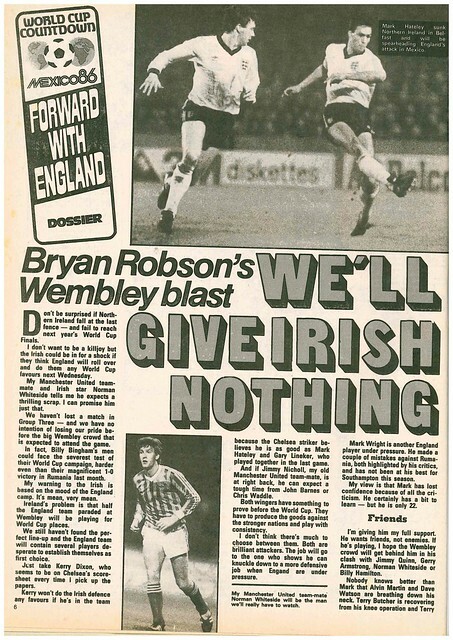 Ahead of the big game at Wembley, Bryan Robson uses his column to declare that England won’t make it easy for Northern Ireland, as Northern Ireland aim to reach Mexico. 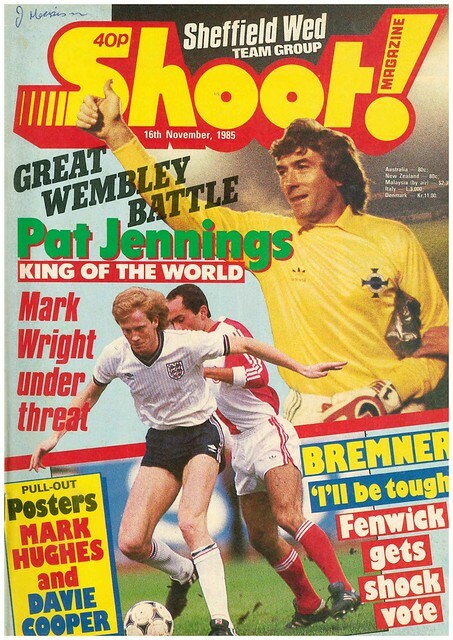 Pat Jennings gets a double page feature, as he becomes the world’s joint most capped goalkeeper, and announced he will retire at Wembley regardless of the result. 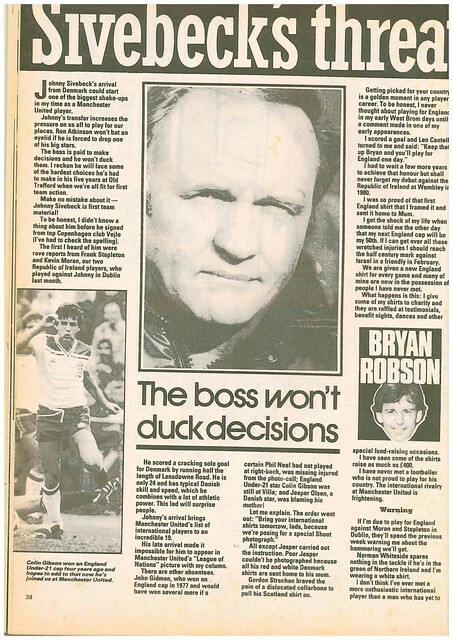 In this feature, it is revealed that England manager Bobby Robson tried to bring him to Ipswich Town in 1977, but lost out to Arsenal. 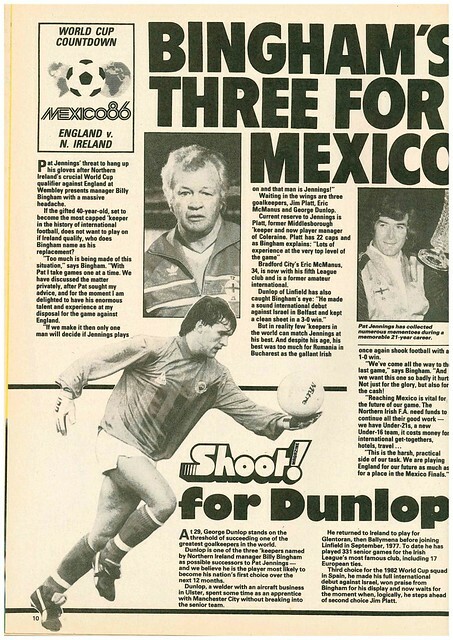 Jennings retirement sees Shoot look at the goalkeeper options for the future, which Shoot narrows down to Eric McManus, Jim Platt and George Dunlop. 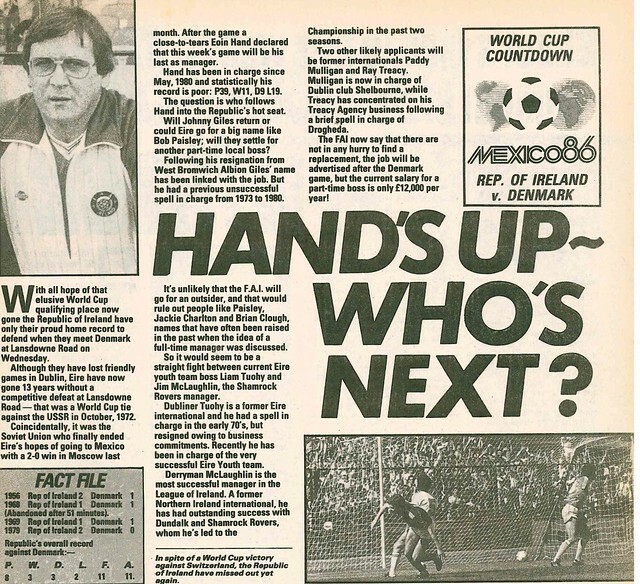 Republic Of Ireland are out of Mexico 86, but are defending a 13 year unbeaten home record in competitive internationals as they face Denmark at Lansdowne Road. 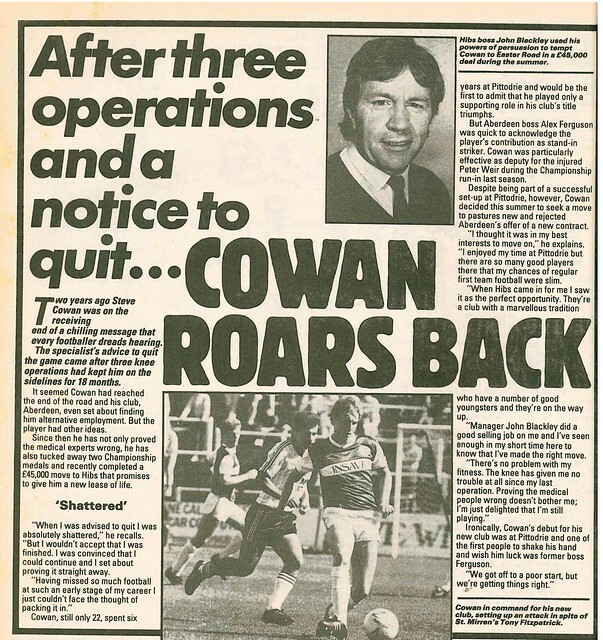 Eoin Hand has already announced his departure as manager, and Shoot has linked John Giles, Liam Touhy, and Jim McLaughlin, having ruled out Jack Charlton and Bob Paisley due to the FAI being unlikely to appoint a non Irish manager. 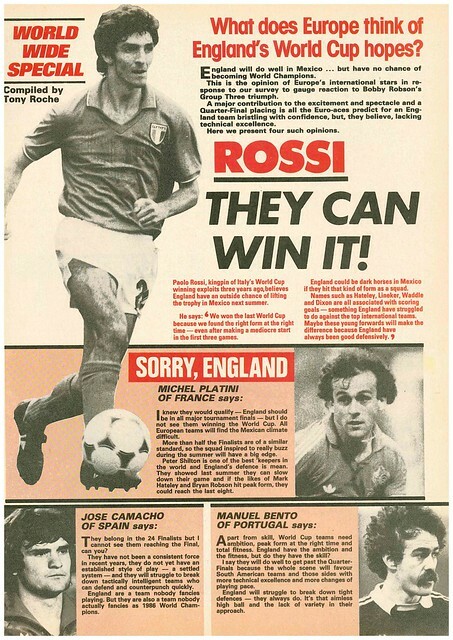 Shoot asks four foreign stars to assess England’s chances in Mexico, with Paolo Rossi saying they can win it, while Michel Platini, Jose Camacho and Manuel Bento saying that they can’t. 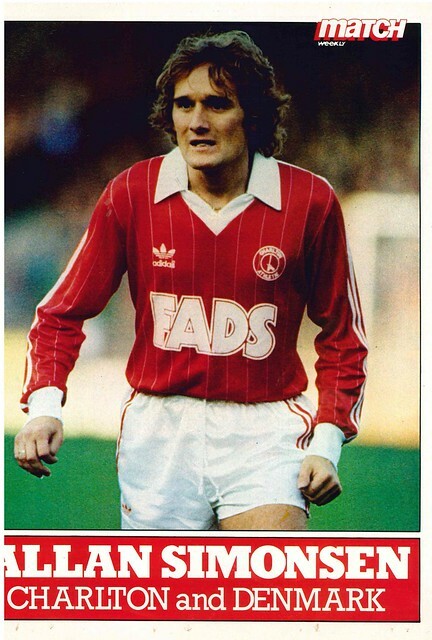 Glenn Hoddle is this week’s “Focus On …..” where he reveals that his favourite music was The Eagles, but it is now Don Henley and Phil Collins. 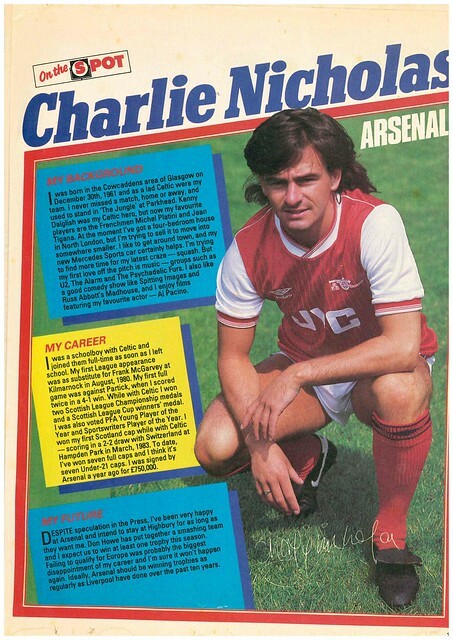 He loves his singing drummers. 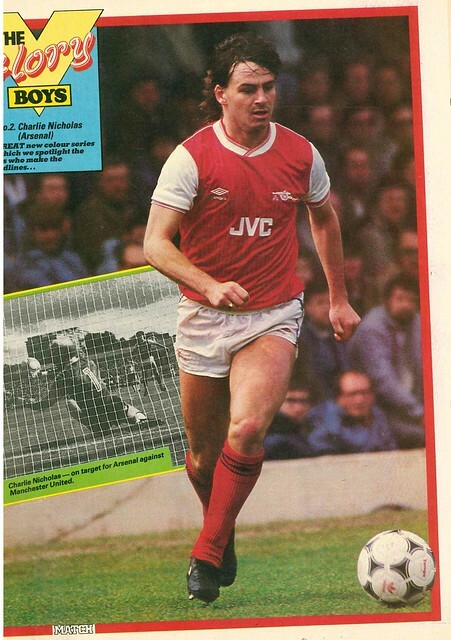 A future team-mate of Hoddle could be Gordon Durie, with Tottenham joining Arsenal and Chelsea in the race for his signature, with Hibs placing a £300,000 price tag on him. 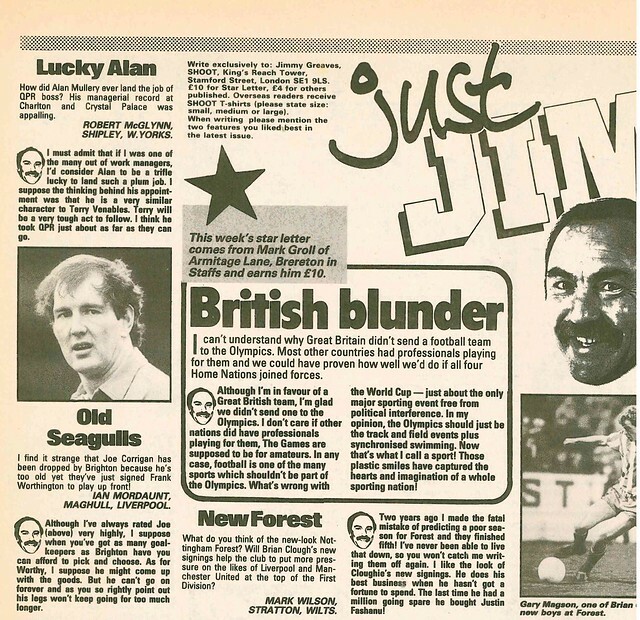 Alan Sinclair of Glasgow writes to Jimmy Greaves to complain about Andy Goram’s call-up to the Scotland squad, as he was born in England, while Andrea Pepper in Carrick says that Northern Ireland won’t need any favours in the forthcoming World Cup Qualifier. 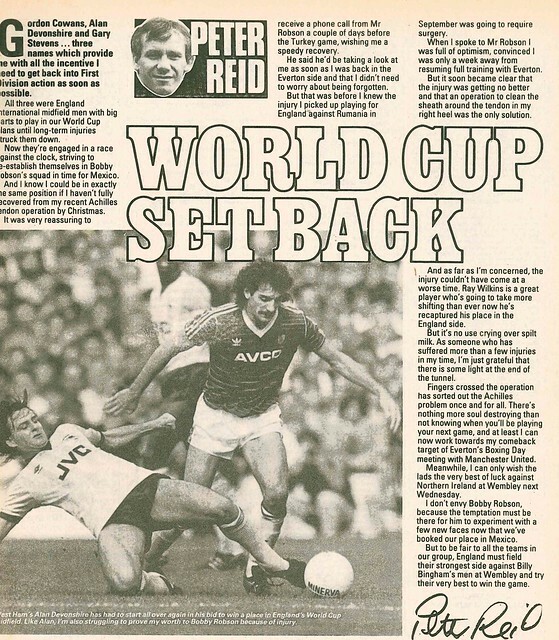 Reading get a profile, while Peter Reid uses his column to reveal he fears missing out on a World Cup place as his injury gives others a chance to stake a claim in the team. 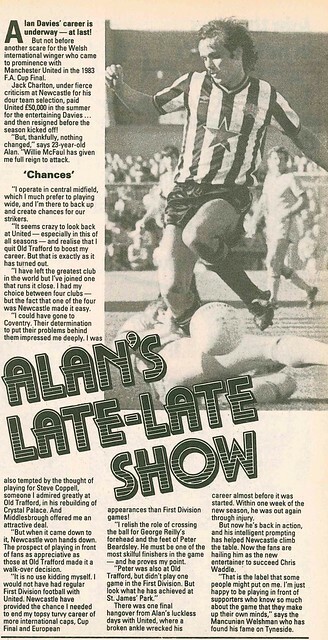 Alan Davies gets a profile, telling Shoot that he is enjoying playing for Newcastle United every week. 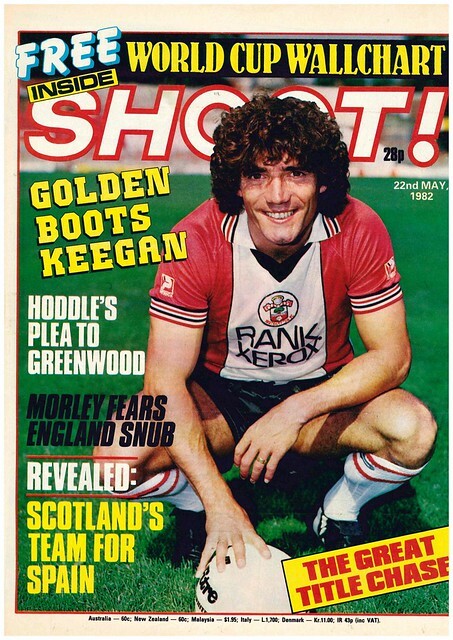 Kevin Keegan is the cover star of Shoot as the 1982 World Cup in Spain approaches, and the 24 competing teams are getting ready for their final preparations. 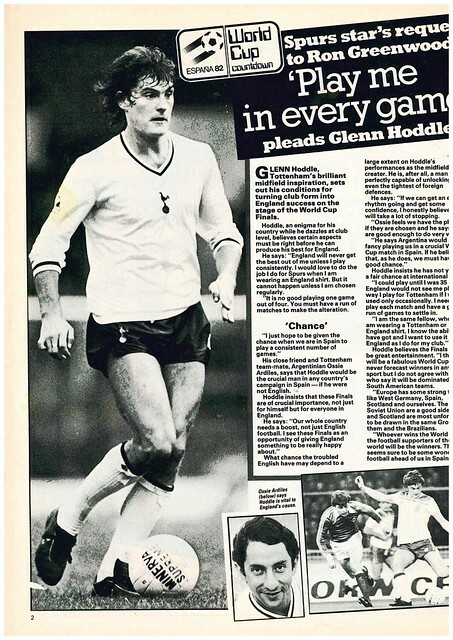 As you open the magazine, Glenn Hoddle tells Shoot that he will only replicate his club form for England if he is given a run of games, while Tony Morley of Aston Villa fears he may miss out in Spain due to manager Ron Greenwood only liking to play one winger. 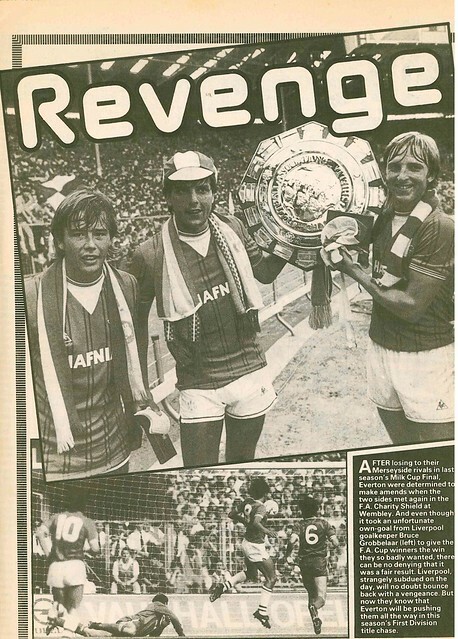 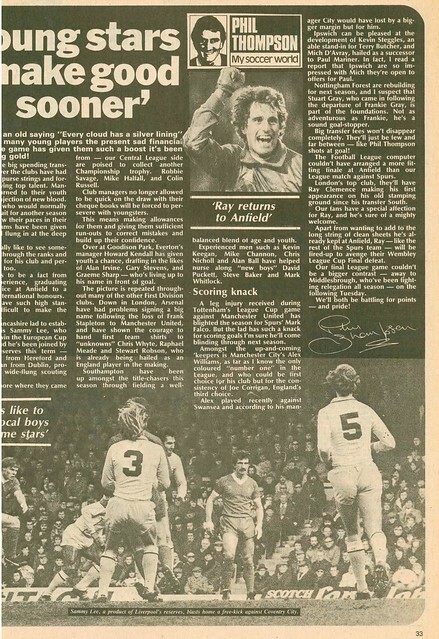 In news, Keith Burkinshaw and John Toshack have declared that three points for a win, introduced in 1981-1982 season, has been a success, while Gordon Taylor hit back at Trevor Francis and Mick Mills over their criticism of the timing of the PFA Player Of The Year Awards. 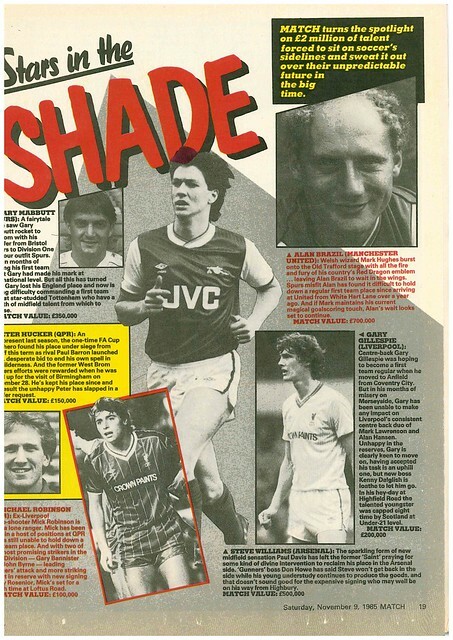 Shoot does a full page profile of Arsenal youngster Stewart Robson, who broke into the first-team straight from school. 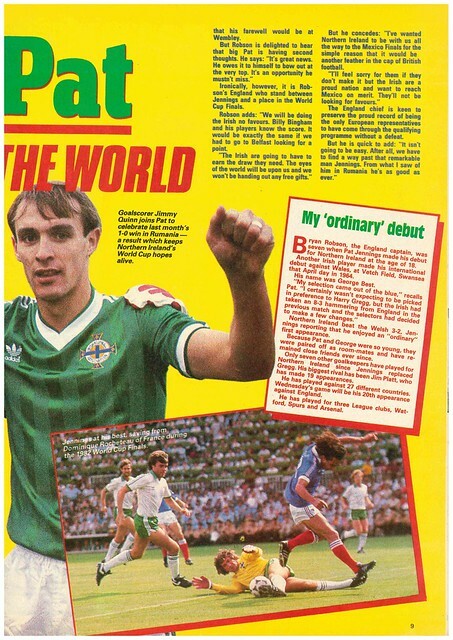 In adverts, you could get a series of World Cup wallcharts for just £3.50, plus 50p for P and P.
In letters, Liam Farrington from Dublin writes in to protest about English born Tony Galvin being called up to the Republic of Ireland squad. 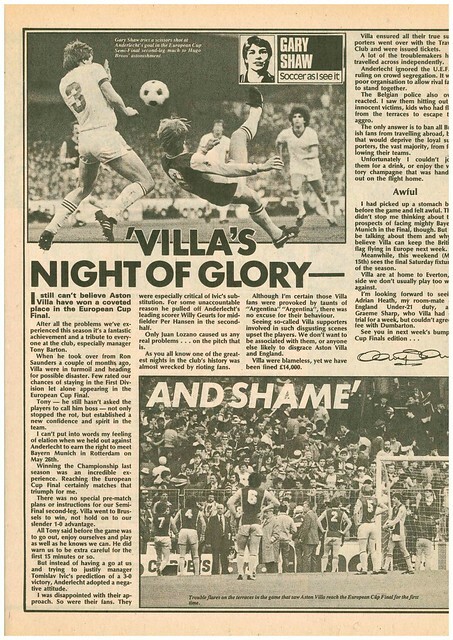 Gary Shaw uses his column to talk about his joy at Aston Villa reaching the European Cup Final, but also his disappointment that the second leg of their Semi-Final against Anderlecht was ruined by trouble on the terraces. 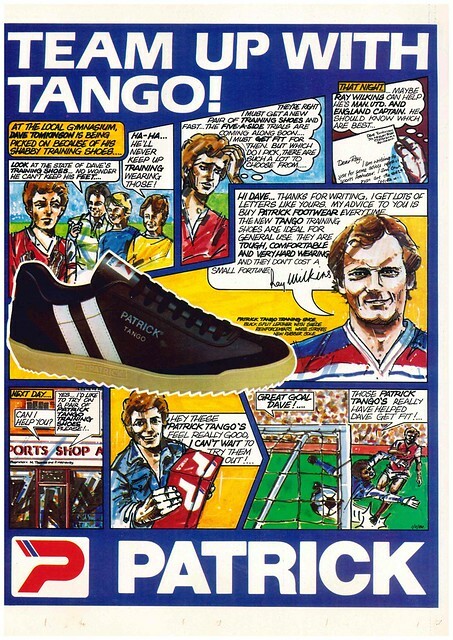 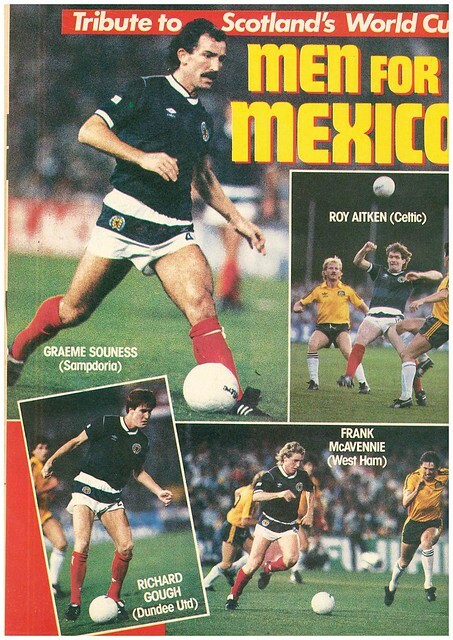 Ahead of Scotland’s World Cup opener, Shoot asks various Scottish players such as Alfie Conn, Frank McGarvey and Paul Hegarty what the starting 11 in Malaga on June 15th should be. 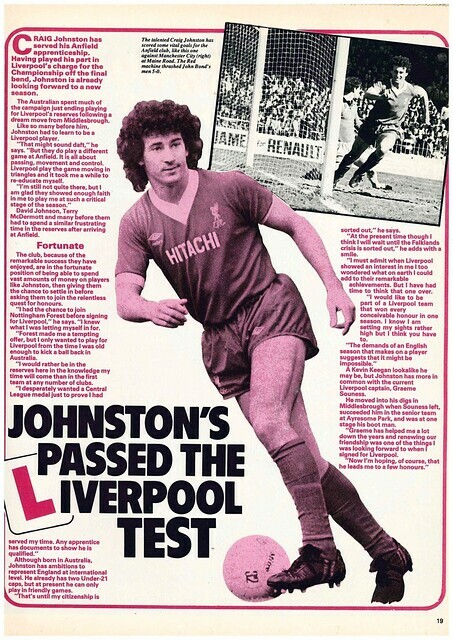 Shoot does a full page profile on Craig Johnston, who he says has passed his Anfield Apprenticeship, and is now a fully fledged first-team player. 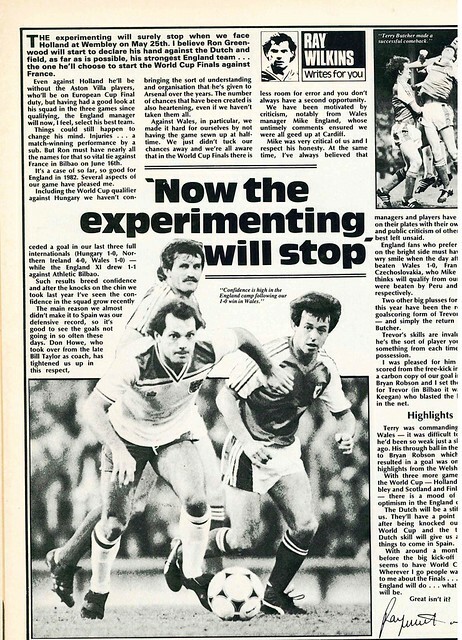 Ray Wilkins uses his column to suggest that England won’t be putting out an experimental side in their friendly against Holland, ahead of the World Cup. 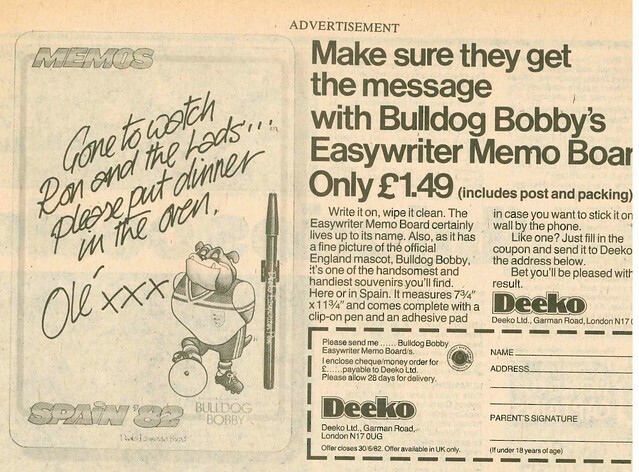 Talking of England, in World Cup Merchandise, you could buy a Memo Pad, complete with a photo of England’s official mascot, Billy Bulldog. 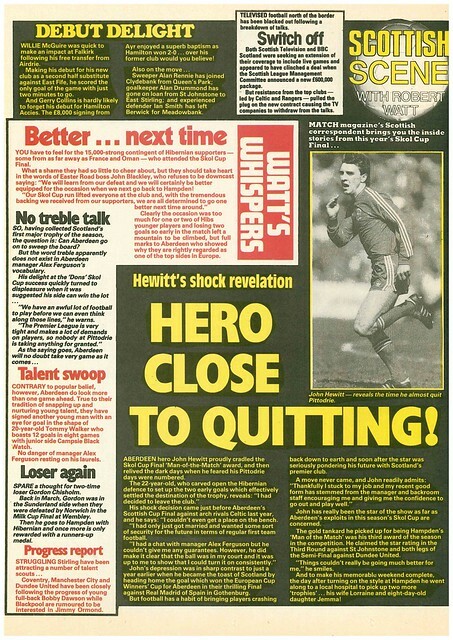 Karl-Heiz Rummenigge is interviewed ahead of the World Cup, and tells Shoot he fears that West Germany’s chances could be ruined by injuries. 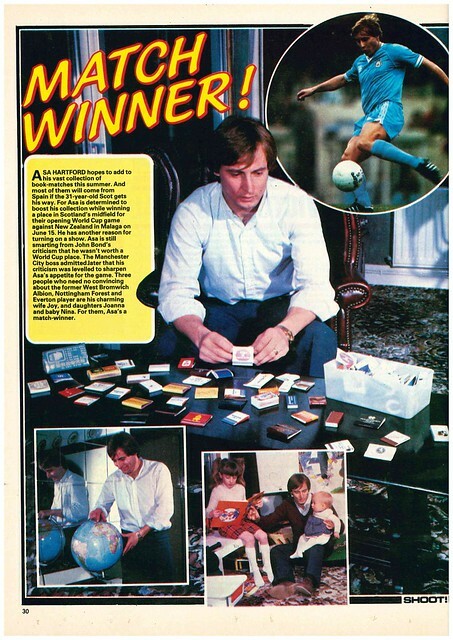 It is revealed that Asa Hartford of Manchester City has an unusual hobby, collecting matchbook. 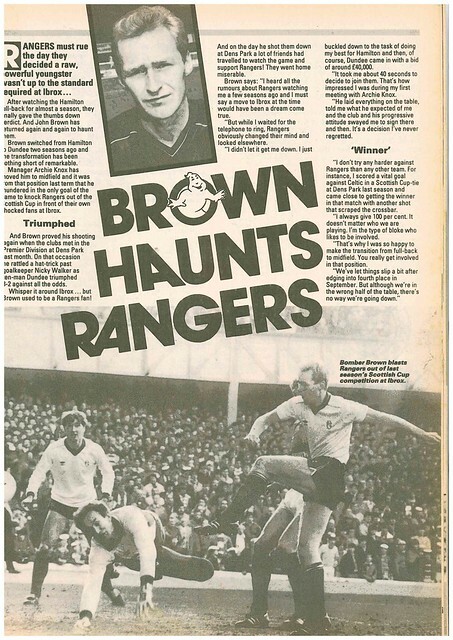 Motherwell were rocked by rumours that manager David Hay was set to resign, while Phil Thompson’s column comments on young players getting an opportunity to play at England’s biggest clubs. 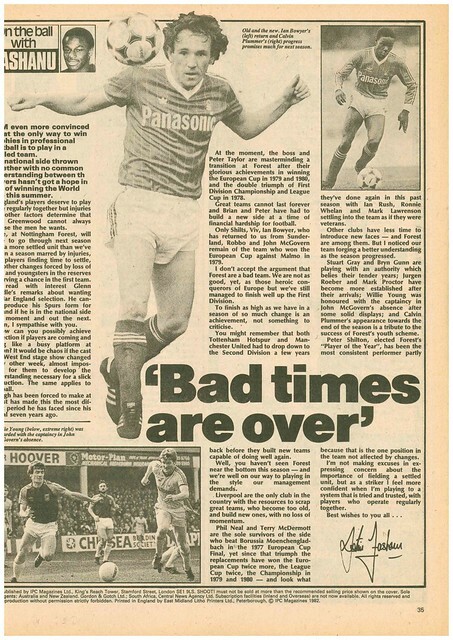 Justin Fashanu uses his column to talk about change in football, as Nottingham Forest go through a transition after a successful period in the late 1970s. 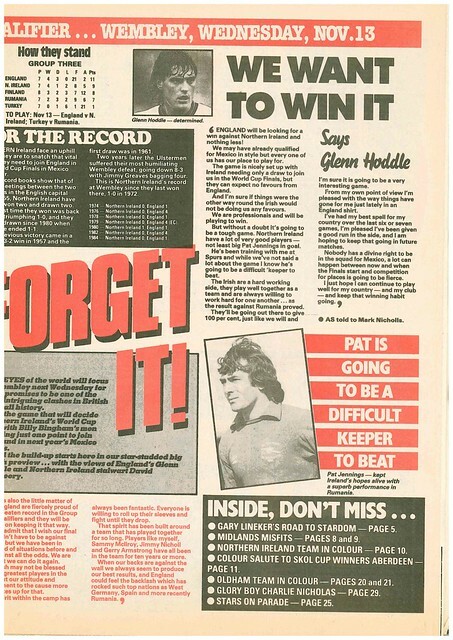 Garry Thompson tells Shoot that he doesn’t want to leave Coventry City, while Everton manager Howard Kendall says that Graeme Sharp is as good as Frank Stapleton. 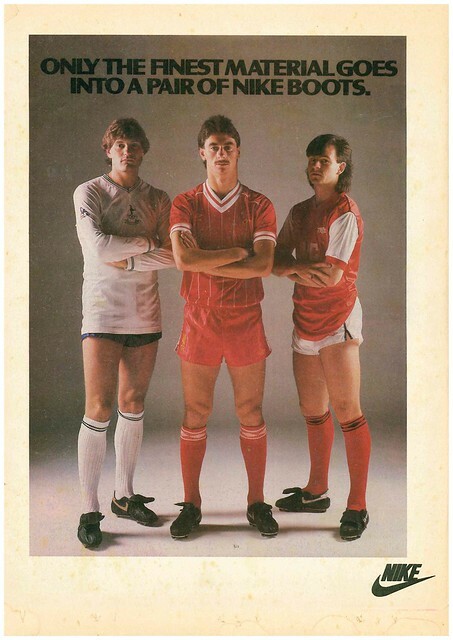 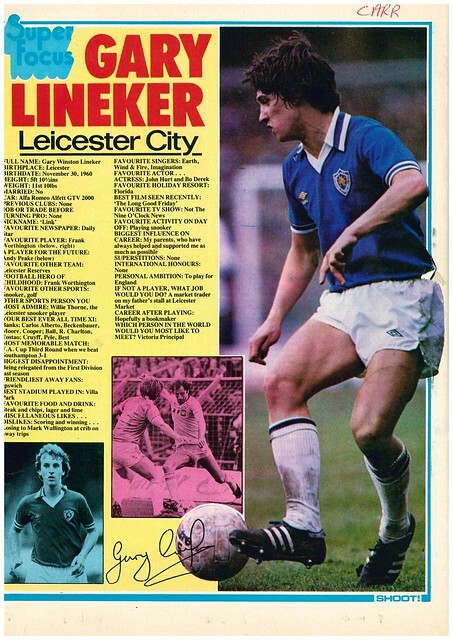 The magazine ends with a profile of Gary Lineker, who reveals he wants to be a Bookmaker when his playing career ends. 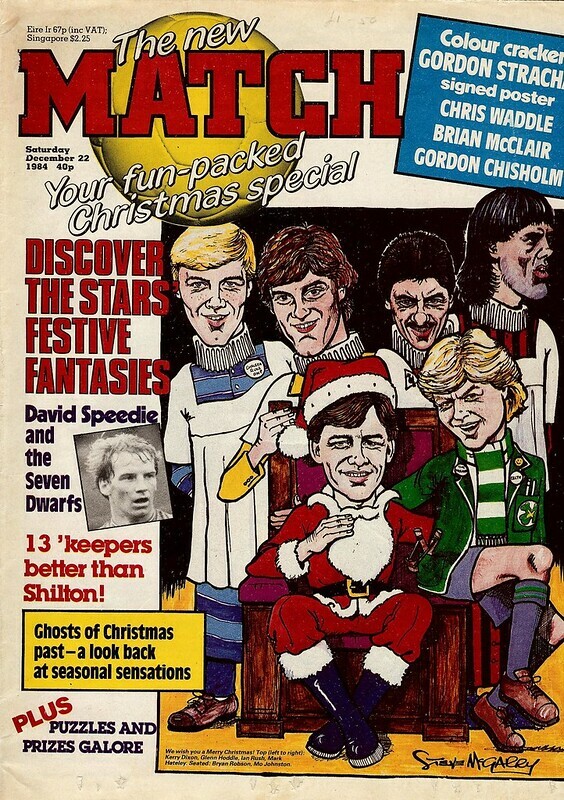 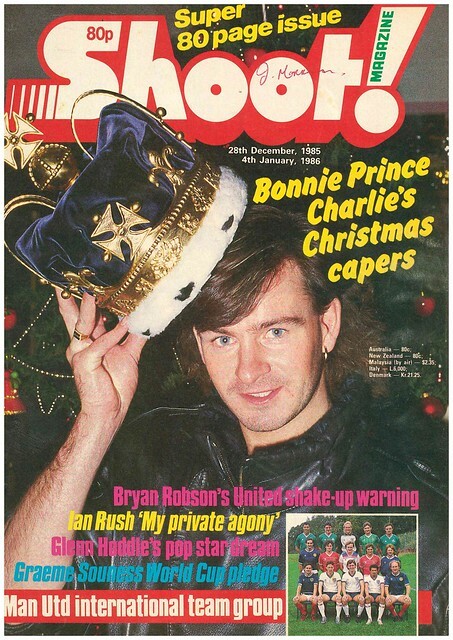 Nothing says Christmas quite like Charlie Nicholas holding a crown, and that’s what Shoot readers were treated to as they tucked into their turkey in 1985. 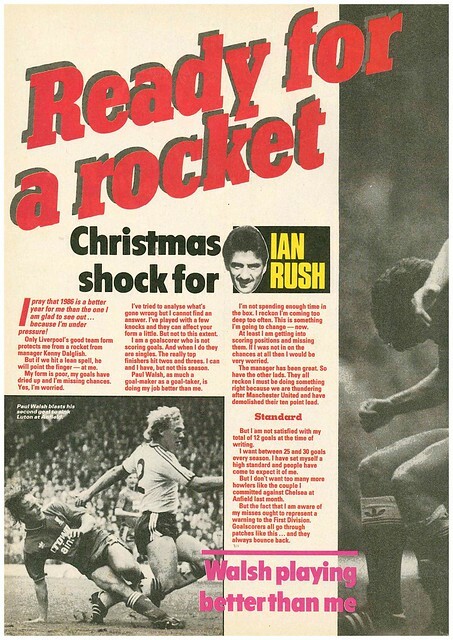 As you open the magazine, Ian Rush writes that he hopes 1986 will be a better year for him than 1985, and saying that Wales players failed Mike England in 1985, while also criticising the FAW for playing their vital World Cup qualifier against Scotland at Cardiff rather than Wrexham. 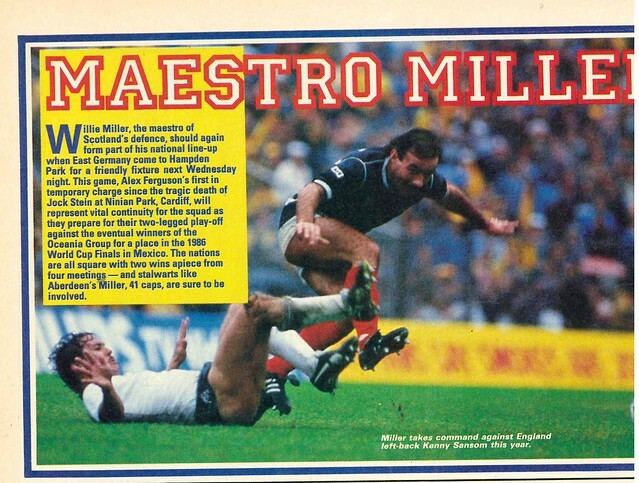 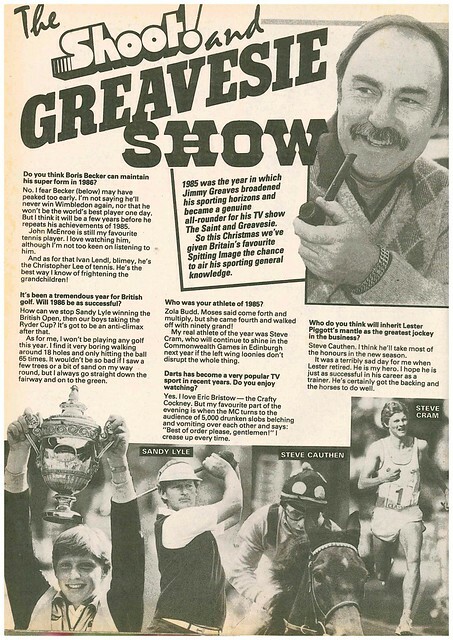 Shoot columnist Jimmy Greaves gets a double page interview, but it’s not football he’s discussing, it’s his predictions for other sports in 1986. 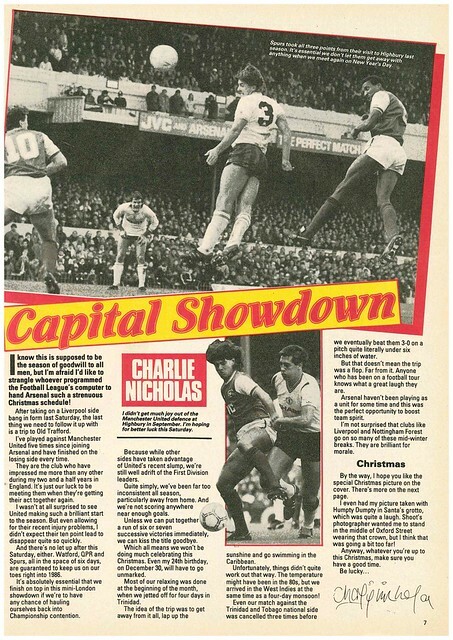 Cover star Charlie Nicholas writes that he is lacking in Christmas Spirit for the fixture computer as Arsenal face Liverpool and Manchester United over the festive period, with Nicholas pointing out that he has been on the losing side in his five games against United for Arsenal. 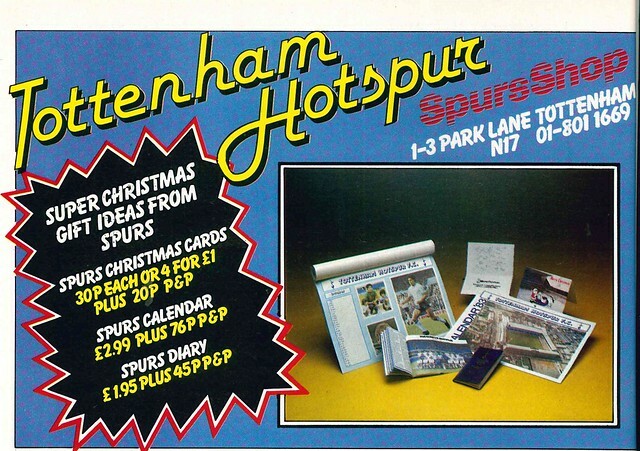 Nicholas is also pictured visiting Selfridges. 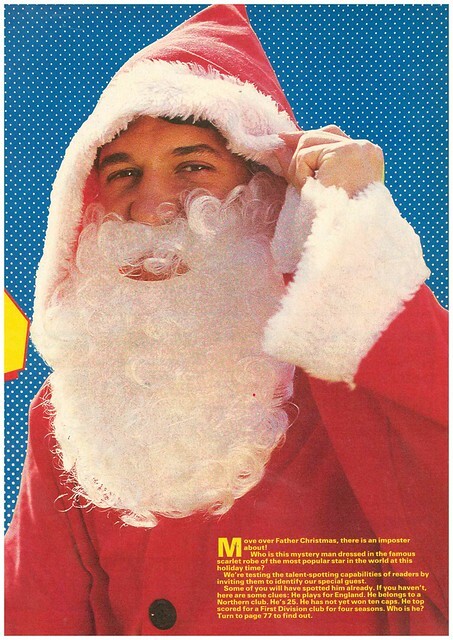 Another top flight player is pictured dressed as Santa. 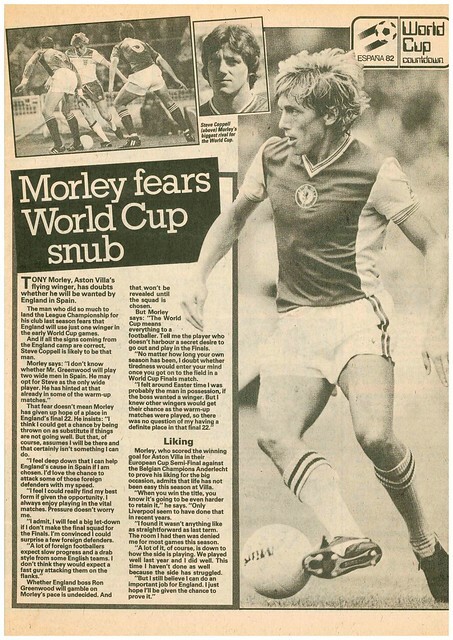 The clues are that he is 25, plays for a club in the North of England and has less than ten international caps. 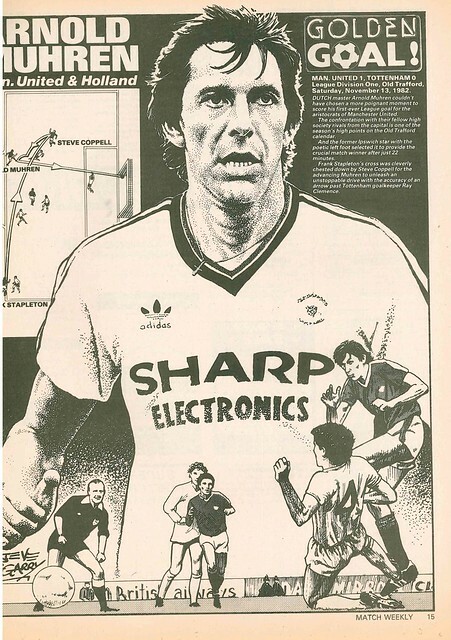 It is revealed later in the magazine that it is Gary Lineker. 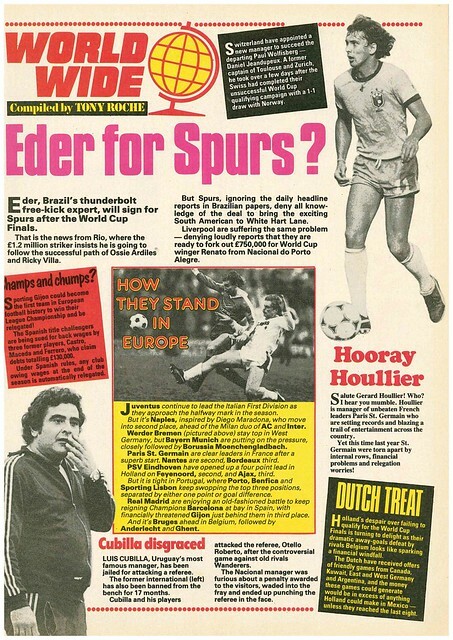 In world news, Brazilian star Eder is linked with a move to Spurs, Gerard Houllier is praised for PSGs unbeaten start in France, and Holland have been offered lucrative friendlies in the summer of 1986 which will earn them more money than if they had reached Mexico. 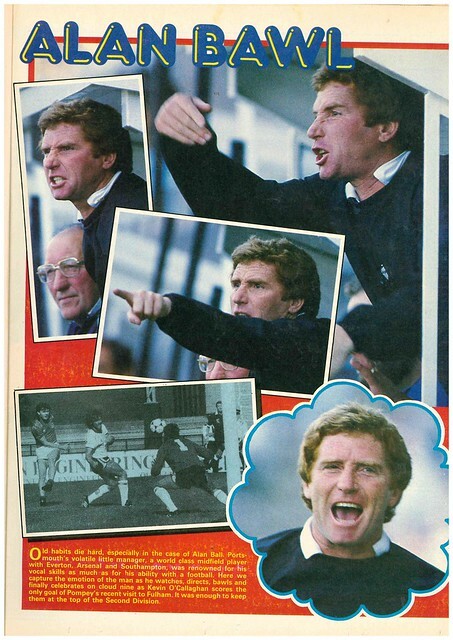 In Uruguay, legendary manager Luis Cubilla has been jailed for attacking a referee who gave a penalty against his team. 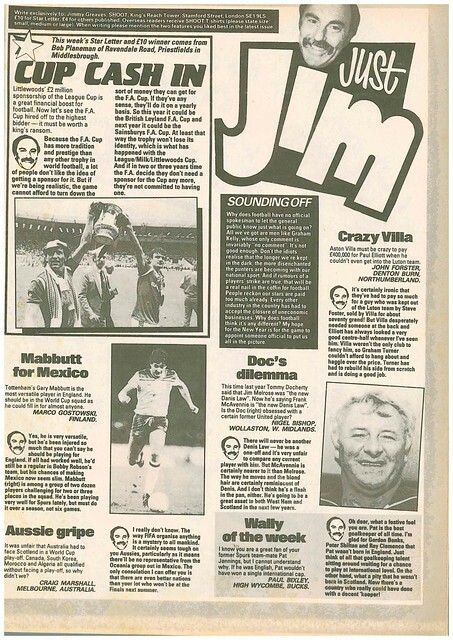 Brian Clough is the subject of a “Focus On ….” feature, where he reveals his favourite musician is Frank Sinatra. 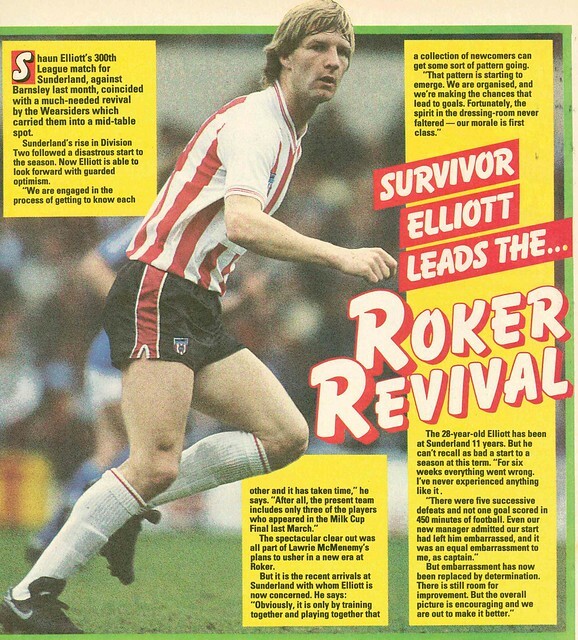 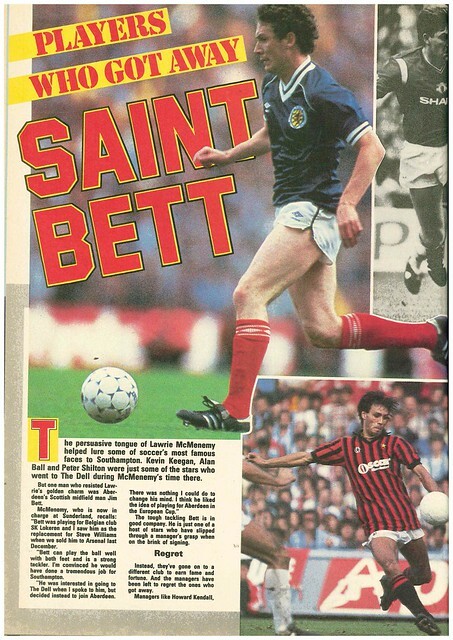 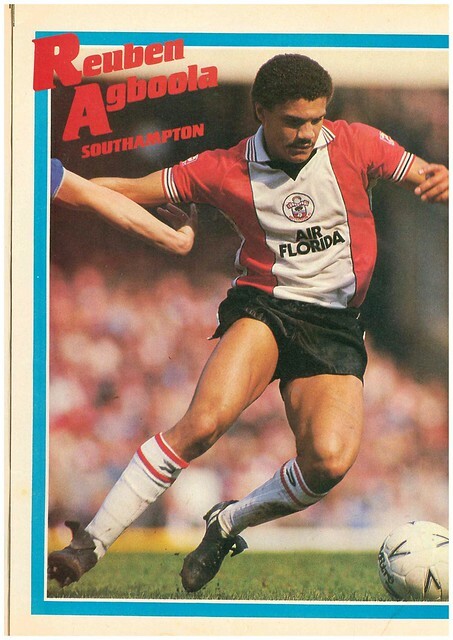 Shoot does a double page feature on transfers that almost happened, such as Jim Bett to Southampton, Bryan Robson to Everton and Charlie Nicholas to Manchester United. 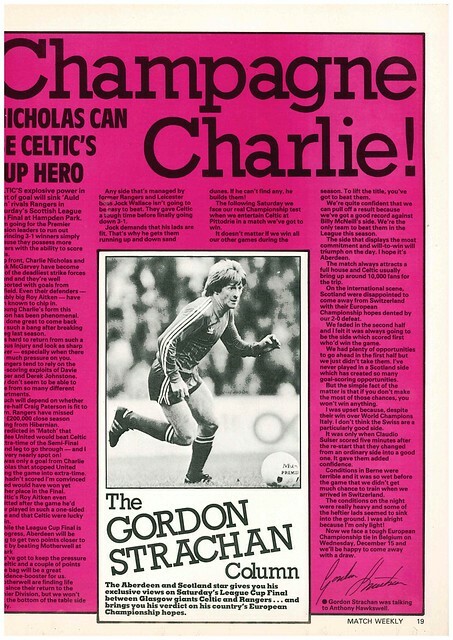 Nicholas decided against signing for Untied after meeting Ron Atkinson, who he says talks about himself too much. 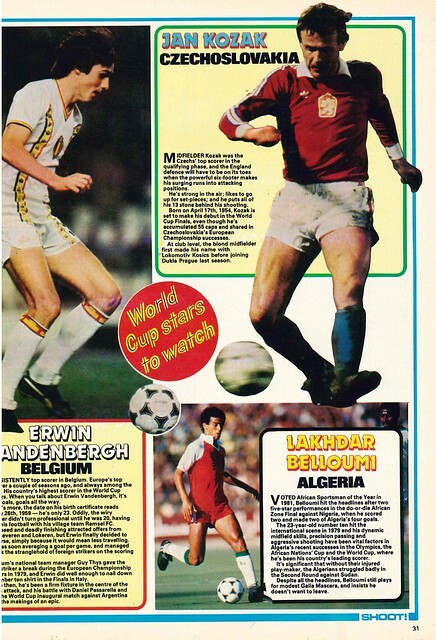 There is a double page spread featuring all the results in the qualifiers for the 1986 World Cup. 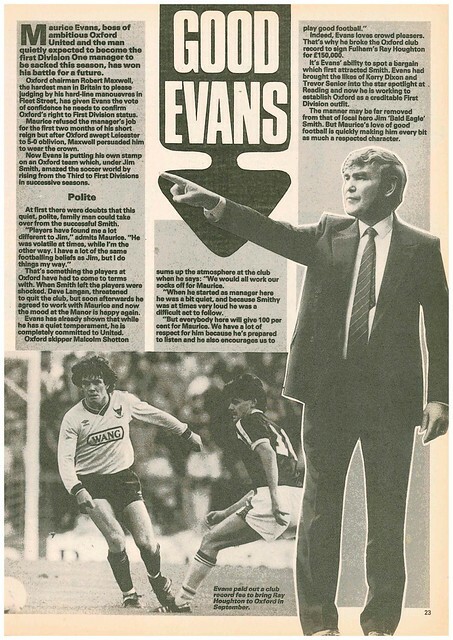 Shoot does a full page profile of Oxford United manager Maurice Evans, who has been given Robert Maxwell’s seal of approval after being predicted to be the first manager sacked at the start of the season. 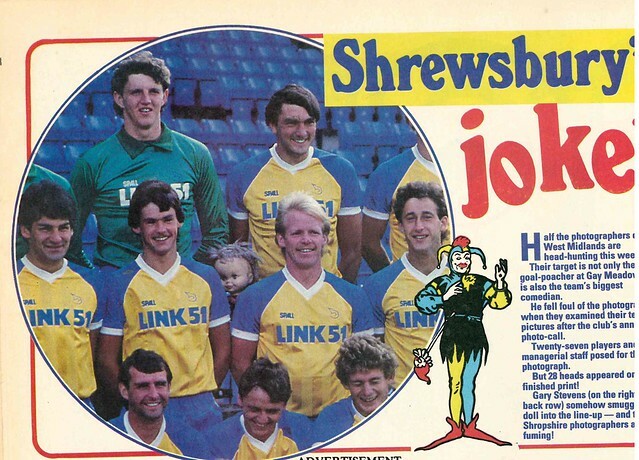 Led by European Cup winner Peter Withe, Sheffield United get a feature and a team poster as they aim for promotion to the top flight. 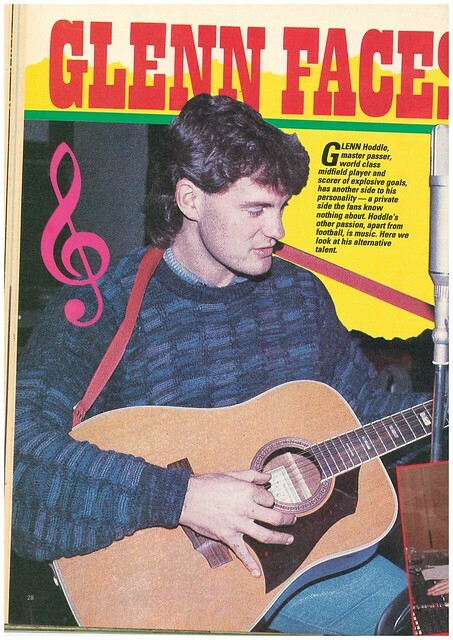 Glenn Hoddle has been making the most of his spare time by spending it in the recording studio, where Shoot joined him, stating that he is determined to become good at Guitar. 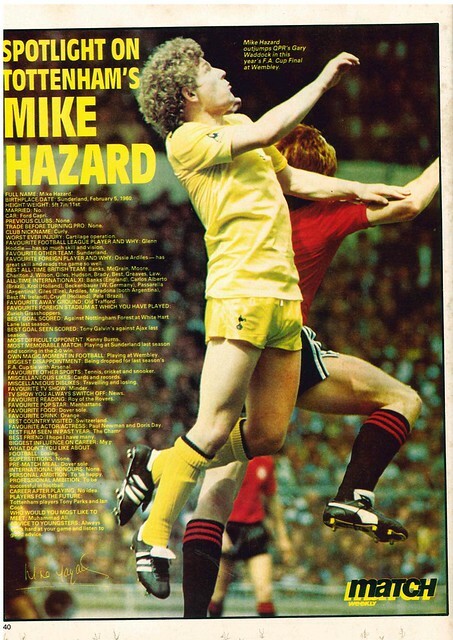 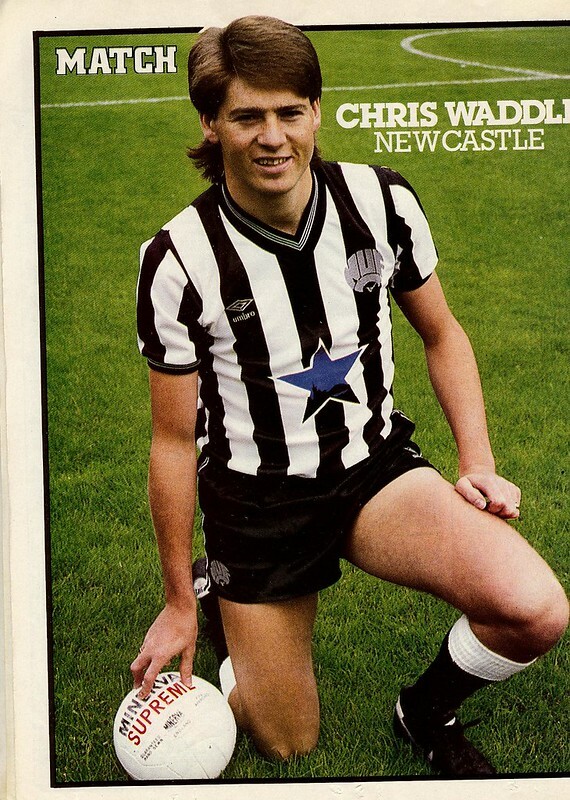 He would have a Top 20 hit in 1987 as part of Glenn and Chris, alongside Chris Waddle. 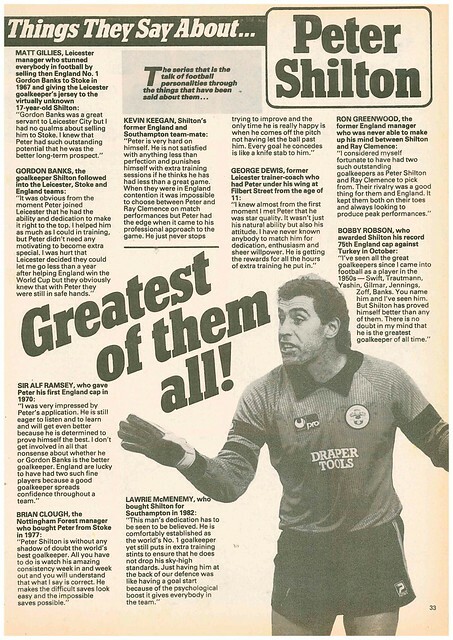 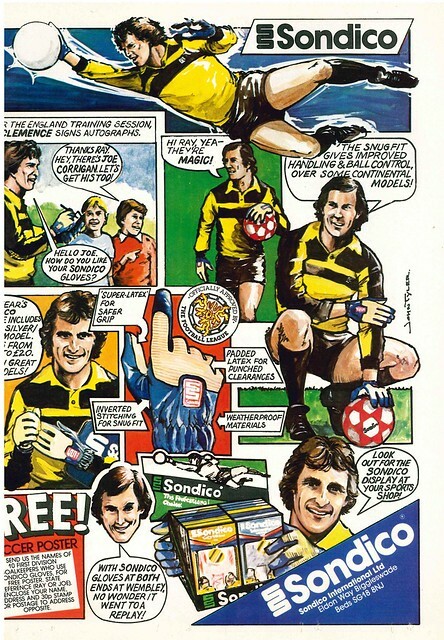 Peter Shilton gets a full page profile, with quotes of what other football personalities say about him. 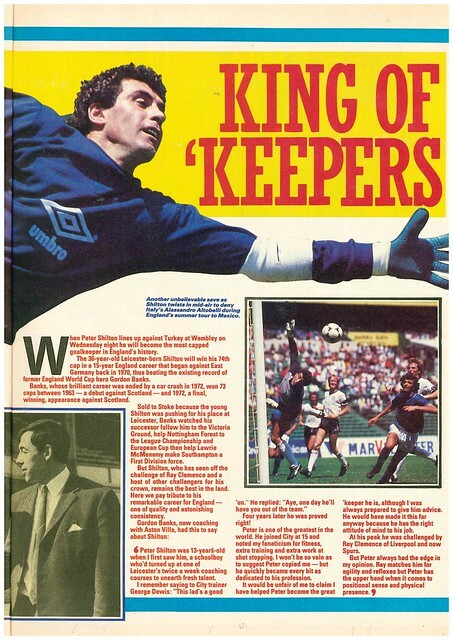 Bobby Robson describes him as the greatest goalkeeper of all time. 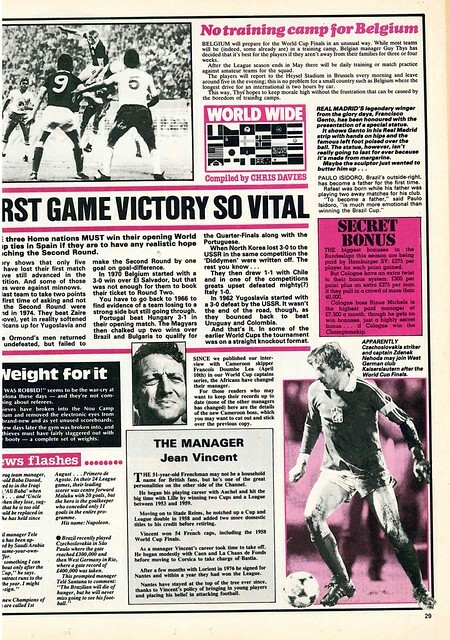 Alex Ferguson of Scotland and Aberdeen gets a double page profile looking at what makes him tick. 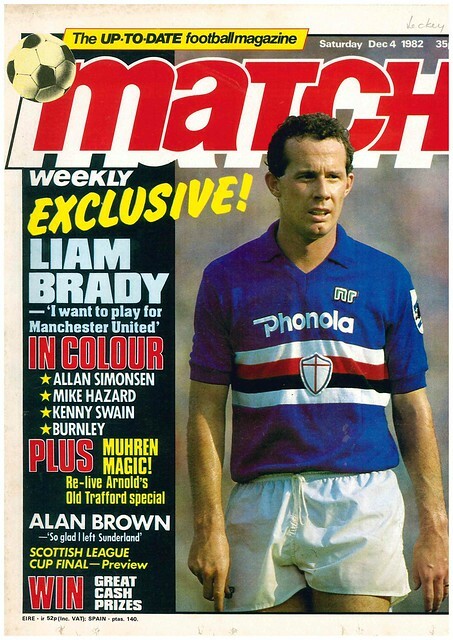 He had recently turned down a move to Inter Milan. 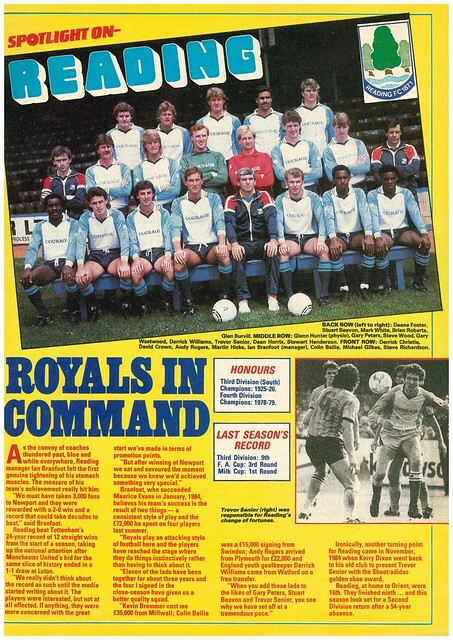 John Bailey gets a profile, having left Everton for Newcastle. 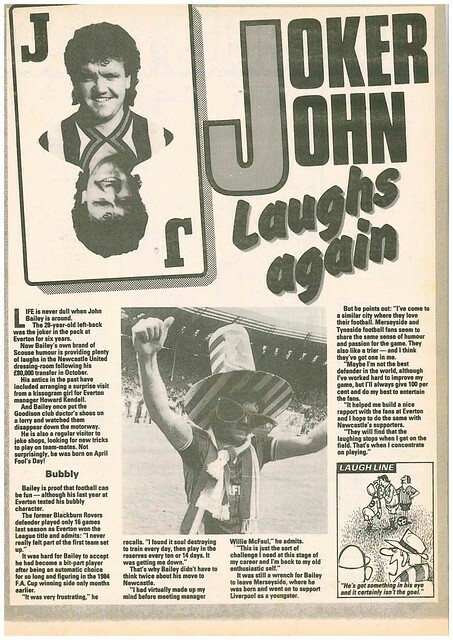 Bailey was seen as a joker at Goodison where he arranged for a Kissogram for manager Howard Kendall. 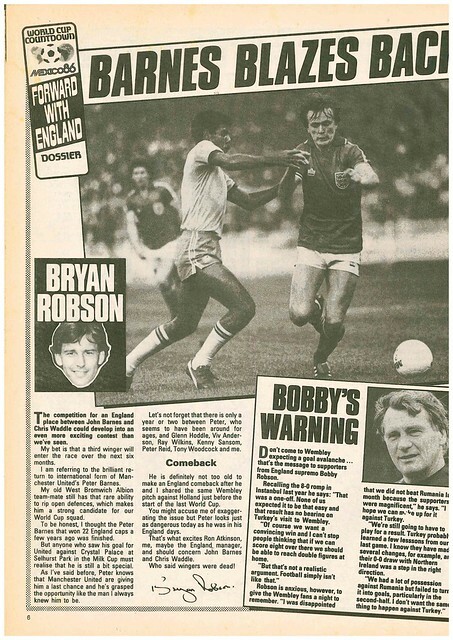 Bryan Robson’s column discusses United’s signing of John Sivebeak, having got glowing reports from Frank Stapleton and Kevin Moran, who faced him in a recent international. 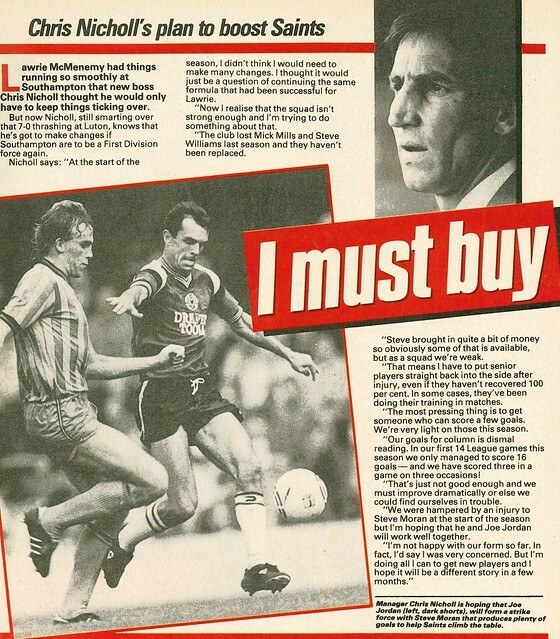 Also writing about a new signing is Paul McStay, who is delighted that Mark McGee has signed for Celtic. 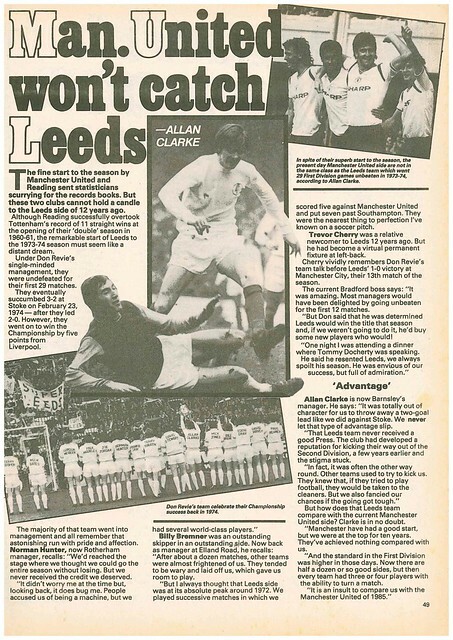 Manchester United’s explosive start to the season brought back memories of Leeds going 29 games unbeaten at the start of 1973-1974, and Leeds stars of that era share their memories. 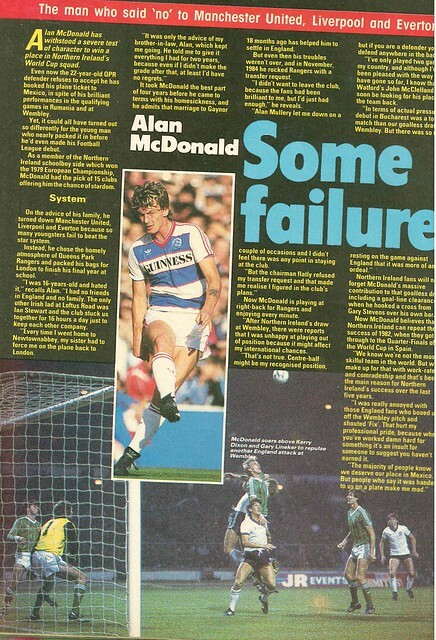 Alan McDonald is interviewed, where he reveals that he turned down Manchester United, Liverpool and Everton to join QPR, hits back at England fans who suggested that their draw with Northern Ireland was a fix, and reveals that he feels he is far from guaranteed a place in Northern Ireland’s World Cup squad. 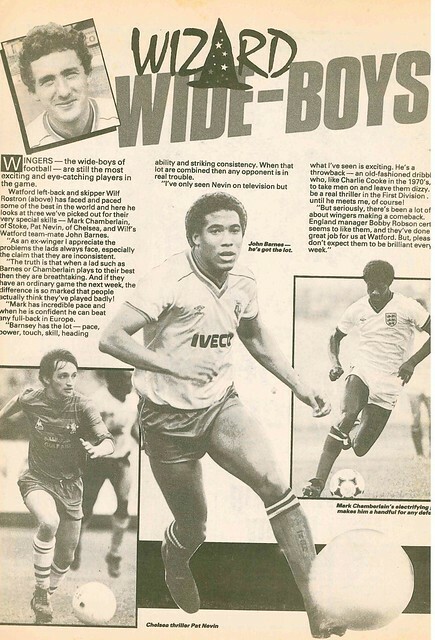 West Ham’s forward duo of Tony Cottee and Frank McAvennie are profiled, where it is revealed that their partnership only came together due to injury. 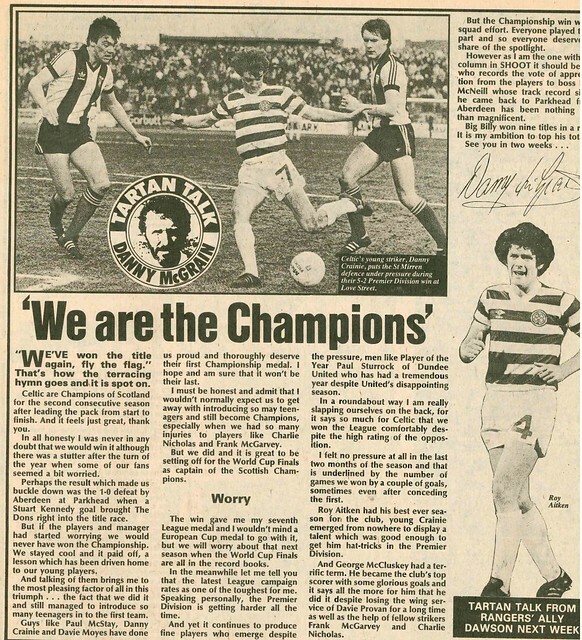 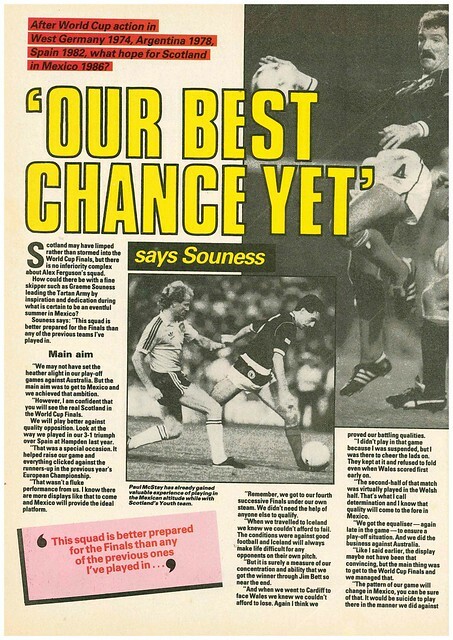 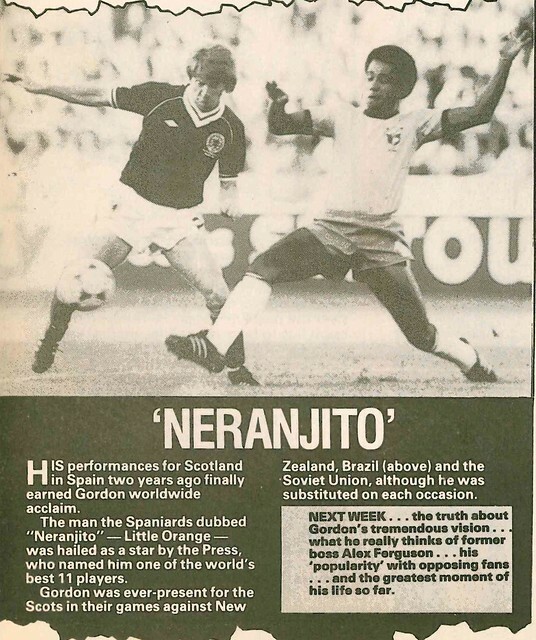 Scotland fans got a double page photo collage from their side’s World Cup Play-Off win against Australia, with Graeme Souness being interviewed over the page, stating that it was Scotland’s best chance to get past the group stages for the first time. 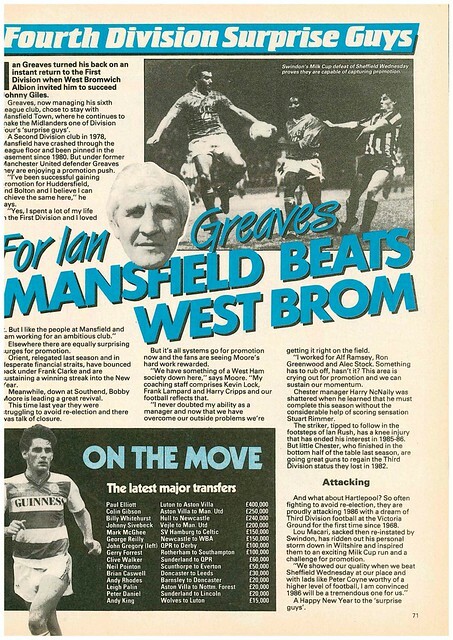 Ian Greaves gets interviewed, having recently turned down the chance to manage West Brom in order to stay at Mansfield. 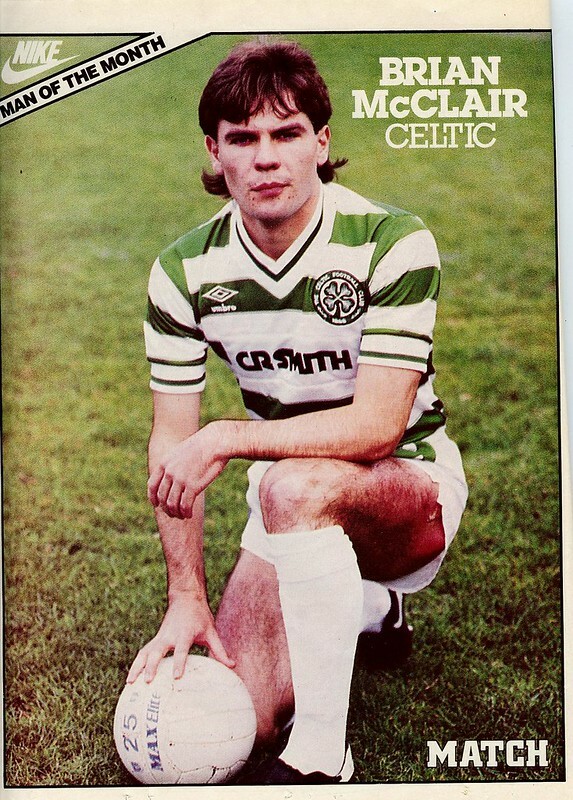 Chelsea and Manchester United are keeping an eye on Brian McClair, who has just handed in a transfer request at Celtic after being dropped to make way for Mark McGhee, while Colin Gibson hopes his recent move to Manchester United will get him a place in England’s World Cup squad. 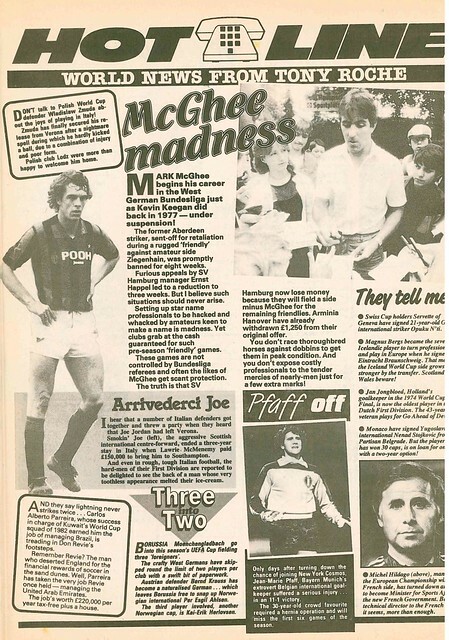 Seamus McDonagh was £900 out of pocket when he played for Republic of Ireland in a recent match against Denmark, after flying in from America (where he plays his club football) at his own expense, and his match fee not covering it. 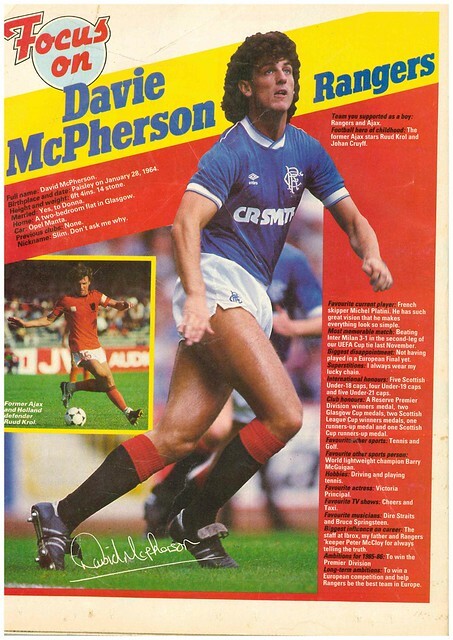 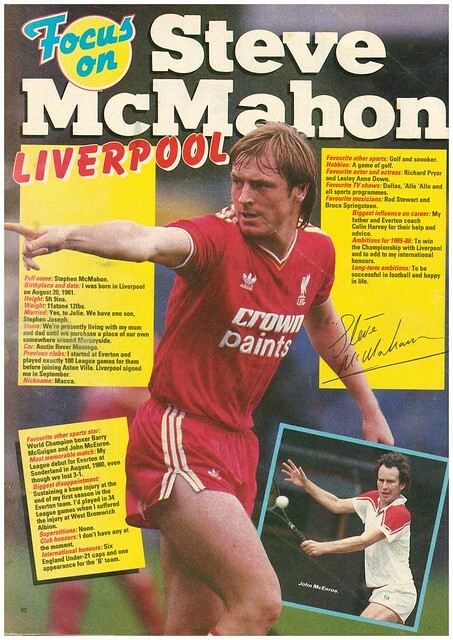 The magazine ends with a profile of Steve McMahon. 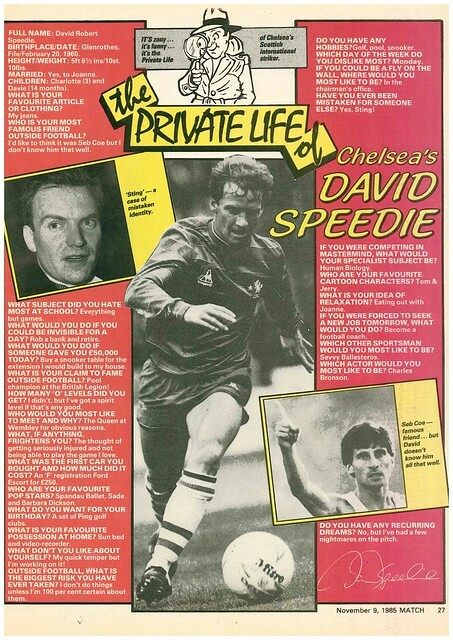 His favourite singers are Rod Stewart and Bruce Springsteen.